Rep. Joseph Kennedy says passing the Do No Harm Act, which he's about to reintroduce in Congress, is a personal mission. Four years ago, I sat around a crowded conference room in Fenway Health, an incredible organization serving Boston’s LGBTQ community, and met with stakeholders to figure out how we were going to pass a bill to protect transgender citizens in public spaces. Joining me around the table were experts, physicians, and activists who led the charge on this vital legislation, but one group that stood out to me were Massachusetts families with transgender children who had come to share their stories. And what I heard from them that afternoon has stayed with me ever since. I vividly remember the young student off to college who planned his car rides home for school vacations based on what states had antidiscrimination laws on the books so he knew where he would be free from legalized bigotry along the way. The family who mapped out any outing based on the availability of inclusive restrooms. The young parents who faced a torrent of doubt and criticism when they supported their 5-year-old son’s transition, yet refused to allow the judgments of others to shake their faith in what their child knew to be true. What I came to understand there, in that room, was that they were fighting for the same experiences we all want for our children: the ability to take their kids to the movies, to send them to school, to wave them off to proms and sports practices and sleepovers with little worry. The small moments so many of us take for granted. The ones that aren’t so small when you can’t have them. But they couldn’t. Not because of anything they did or some extenuating circumstance that would pass with time or effort. Rather, because their country — deliberately, consciously, consistently — told them that their child didn’t deserve the same protection and opportunity and experience as the next kid. Since that moment, these families became a top priority for me in Washington, where I was honored to take over as chair of the Congressional Trans Equality Task Force in 2017. And I assumed this position just after the election of President Trump, who has brought our fight into sharp focus, as he immediately launched a coordinated, relentless, nationwide assault on the civil and human rights of transgender Americans. Within the first weeks of taking office, the Trump administration scrubbed references to LGBTQIA+ rights from the White House website and announced it would no longer defend Gavin Grimm or the countless students facing discrimination in school. These efforts continued, attempting to remove questions about sexual orientation and gender identity from the U.S. Census, implementing a ban on transgender service members, and working to literally erase transgender citizens by excluding them from federal civil rights law. In the midst of this onslaught, parents of trans children gathered in Washington a few weeks ago to share their experiences about what these changes meant for their families. One parent spoke of the statistics and stories of violence faced by trans women of color. She said that she cannot get them out of her head and is forced to confront the fact that no matter what she does, her black trans daughter will face threats to her safety that the rest of us won’t. A military mom described what it meant to their family and their trans daughter, Blue, when our president questioned the patriotism of transgender troops. Another recounted having to defend her daughter’s very existence in the eyes of her home state government. The voices were different, yet all shared the excruciating pain of having to assure your son or daughter that you count even though your government says you don’t. Or even though your country treats you as second-class that yes, you matter. And even while your president insults, degrades, and demeans the very essence of who you are, know that yes, you are beautiful and kind and powerful and worthy. What’s probably hard to believe is that these kids are among the luckier ones, with parents who have not wavered in their support and advocates by their side. But imagine how many of our trans neighbors today soldier on alone, in the shadows, in the painful reality of life lived under discrimination’s thumb? Because a country that staked its claim on the radical notion of life, liberty, and the pursuit of happiness must do better. Because the one enduring failure of American history is that those basic promises have too often been limited to straight white cisgender men. Because it is incumbent on those of us privileged enough to have our country’s protection to not just get comfortable with — but to demand — the sharing of that justice and dignity with all. It’s why we fight for the Equality Act, introduced by Congressman David Cicilline, which would extend ironclad antidiscrimination protections to all. It’s why I joined Congresswoman Jackie Speier earlier this month to introduce a bill that would stop the trans ban in its tracks. And it’s why, today, I’m reintroducing the Do No Harm Act with Congressman Bobby Scott and Sen. Kamala Harris, which would ensure that religious liberty can no longer be used as an excuse to discriminate against anyone based on their race, gender identity, or sexual orientation. A few years ago, I became a dad myself. Nothing brings you face to face with vulnerability like becoming a parent. From that first breath, you will spend every moment wrestling with the consuming joy and uneasy vulnerability of loving something so deeply. You tell yourself that if you are prepared enough, involved enough, if you do everything right — you'll be able to protect them from the pain life throws their way. Of course, you realize that there are places your protection cannot reach. Bullies and broken hearts, sickness and prejudice and hurt. But you find solace in the one thing you can do, day in and day out: fight for a country that allows your children — all children — to be exactly who they are. Without exception, caveat, or condition. 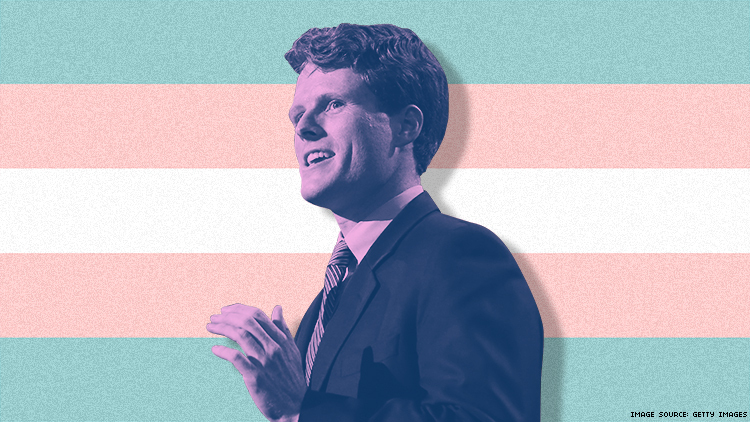 REP. JOSEPH KENNEDY III represents Massachusetts's 4th District in the U.S. House of Representatives.